Downers Grove, IL is known as one of the state’s most picturesque towns. With a housing stock made up mostly of large, older homes, the neighborhoods of Downers Grove are teeming with families looking for a suburban lifestyle while being close enough to the hustle and bustle of Chicago. Despite its growing population of about 50,000, Downers Grove has maintained its hometown feel. The village has been ranked as one of the country’s friendliest communities in America by Forbes magazine. Downers Grove is home to many diverse businesses, unique boutiques, social community events, and dining establishments. Founded in 1832 and with an early history that might have included a stop on the Underground Railroad, Downers Grove is a historic city and a bustling Chicago suburban community. Downers Grove has also developed a vibrant and bustling downtown that includes booming residential and commercial development. As a stop on the Burlington North Santa Fe Railroad, the town has become a perfect spot for suburban commuters who work in the city. Downers Grove contractor Carmody Construction has been completing window, siding, roofing and remodeling jobs in town since our founding in 1948. We are a family owned and operated company with the knowledge, expertise and experience to complete your Downers Grove construction job to complete satisfaction. Our owner, Patrick Carmody, took over the business from his father in 1976, and in 1991 the Carmody boys joined the company. 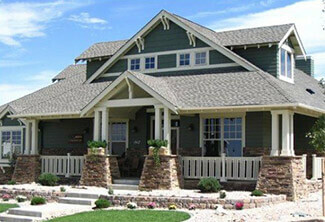 It was also in 1991 that Carmody Construction began building custom homes in the Chicago area. We have built several custom homes around the Downers Grove area, and we are experts in navigating the local permitting process. Whether you’re looking to replace your roof, windows or siding, build an addition onto your home, or remodel your kitchen, bathroom or basement, Carmody Construction is the Downers Grove contractor you can trust. In addition to free consultations, we also offer terms that will make financing your project a breeze. If you’re searching for high quality craftsmanship for your Downers Grove construction project, contact Carmody Construction today! Live in Downers Grove? Need Windows, Siding, or Roofing Services? Schedule an appointment today!